I recently posted an article about the future of home libraries in our digital age. This was sparked by my work on a home library interior design project. Much of the feedback I received was that the Beautiful Habitat readers wished they had a home library. You can have a library, even if your home wasn’t built with a dedicated library space. Make space for your home library in another room. One of the easiest transformations is in the formal living room. As the formal living room is becoming a less used and less desired space in the modern American home, this is a great opportunity to create a home library. I did just that for a client recently. My clients are not formal people, so a formal living room would have been an unused space. My clients were also downsizing. Wasting space in their new, smaller home, was not an option. They are avid readers and had a large book collection. A library was a far better use of the living room for the clients in this home. We started with beautiful bookcases. Next came comfortable seating, arranged to take full advantage of the books and the cozy fireplace. The room is a soaring two-story space. Adding colorful artwork not only adds more interest, but also helps to fill the tall space above the bookcases. A window seat offers another comfortable nook for reading. While this living room was redesigned to be a dedicated library, you certainly don’t have to go that far with it. You can add a library into a living room or family room space with the addition of some lovely built-in bookcases. If you have a fireplace centered in the room, this is an easy addition. Now the room is dual purpose. If you don’t have a formal living room to convert, there are still many opportunities for a library space. One clever option is to convert wall space in another frequently used room. The family room is a great option – you already spend quite a bit of time there and the seating is usually comfortable and inviting. Dining Rooms are another opportunity to create a home library. Like formal living rooms, dining rooms aren’t used as often as they once were. Going double duty by using the dining room as a library makes the space more functional and maximizes the square footage and purpose in your home. 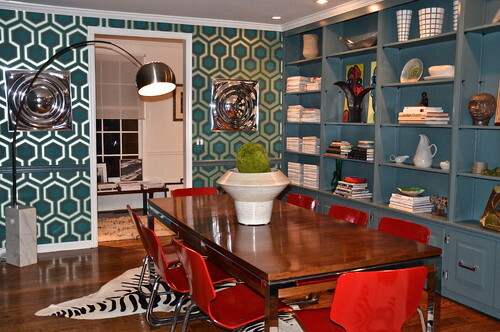 Your dining room library can be one wall, or the whole room, depending your book collections to display. Bedrooms are another opportunity for a home library. Bedrooms, particularly the Master Suite, are far more used than a formal living room or dining room. This option is less about adding value to unused rooms in your home. Most people like to read in bed. Turning your bedroom into a double duty bedroom library adds an interesting feature, while also creating convenience in nighttime reading. Adding a window seat and bookcases to an otherwise blank wall is always a nice touch. The window seat becomes a beautiful architectural feature. It also gives you a place to read other than the bed. The bed is already the focal point of a bedroom, but why not really emphasize it with a bookcase surround? This makes a dramatic statement, while also being functional. Have you carved out a home library space for yourself? Has this post inspired you to create one?